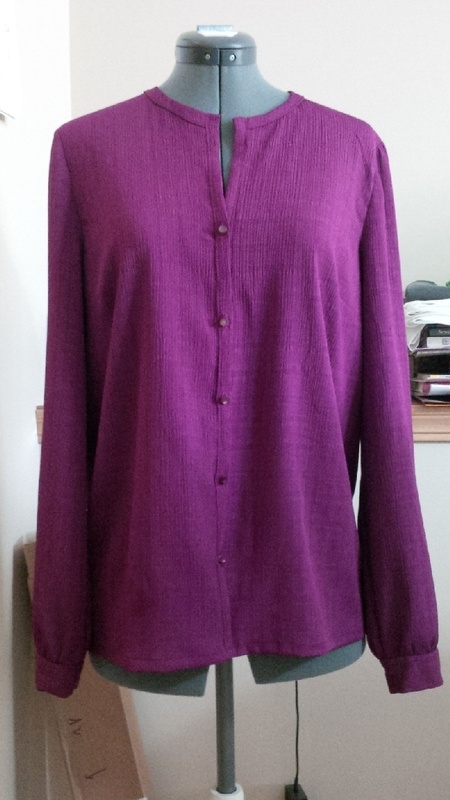 Burda 7188 – Complete!! | Fabric, Thread, Clothes? Posted on March 30, 2014	by Fabric, Thread, Clothes? It’s done!!! I’m so happy to get this done and it will definitely augment the work wardrobe nicely. I am going to make some more of these once I find some fabric that I really like. The hardest part of this one was actually the buttonholes!! I decided on these really pretty shank type buttons that matched very closely. When I made the buttonholes with my buttonhole foot, they were all too small! I have never had that happen before so I think it’s (maybe) due to these being a shank type button. I found a button that was a little bigger and made some samples and it worked okay. I really wish I would have used the even slightly larger button because these are tight to button and un-button. That’s ok though b/c this shirt is loose enough that I really don’t ever need to undo the buttons; I can easily get the blouse on over my head. This pattern went together like a champ…I need to do a review on it. I find that because I have signed up for the RTW fast this year, I’m being particularly picky about what I do choose to sew and it has slowed down my sewing. Is anyone else finding that or am I the only one?? This entry was posted in Burda, RTW Fast. Bookmark the permalink. 3 Responses to Burda 7188 – Complete!! My recent button hole issue is that they have turned out slightly too big. On my recent two shirts the chest buttons keep popping open, not a good look so I will need to sew up slightly. With the RTW fast I am also thinking about what I need to make more carefully. I’ve recently done some new tees so I feel wardrobe not too bad. I need to be making things that are going be versatile and will get a lot of wear. This is so pretty – the color caught my eye but it is so simple and classic in design. And, yes, the RTW fast has me making what I NEED vs. whatever catches my eye. But that is a good thing, too. Maybe my wardrobe will be more coordinated. I just love that colour! Looks great!